AGB Nielson Nationwide had this episode coming in at 22.9%. Yeon-ah pretends that she’s not going to threaten Mi-ryeong; she disguises her threat as a plea. She begs Mi-ryeong to break Joon-ho and Soon-shin up. In return, she won’t tell the world about Mi-ryeong’s role in Chang-hoon’s accidental death. We go from Yeon-ah’s annoying face to utter cuteness: Joon-hon won’t let go of Soon-shin’s hand. She asks him to release her hand, but he reminds her of her promise to never run away. She points that people are staring and might take pictures. He teases that it’s because he’s so handsome. TRUE DAT! Then his mother calls, guh, and he cuts off the call. He lies to Soon-shin that it was an employee and proceeds onto more cuteness. Mi-ryeong is reliving the night when Chang-hoon died and is so shaky that she takes out a bottle of pills to calm herself. She really is a self-medicator. Luckily, Soon-shin comes home and takes the sedatives from her. She asks her to stop taking them and invites her downstairs to eat to relieve her stress. But Mi-ryeong is too preoccupied to eat and she outright asks if Soon-shin is dating Joon-ho. She admits it hasn’t been for long. Hwang congratulates her because he knew Joon-ho couldn’t be dating Yeon-ah. He wonders who spread the rumor. Mi-ryeong worries about what will happen if people find out; a star’s life isn’t her life. She has to focus on her image. Soon-shin understands and promises to be careful. Chan-woo and Yoo-shin come out to go to work. Gil-ja reminds her that tonight is kimchi making night and Yoo-shin adorably promises to be there. Which totally means that she WON’T. I am proved right at work when a work problem comes up that she has to take care of. Mi-ryeong struggles over what to do about Yeon-ah. Hwang brings juk that Soon-shin made for Mi-ryeong and Mi-ryeong finally admits Soon-shin was raised right. He is happy they are getting closer and advises her to start being a good mother to her daughter. In-sung reports that Soon-shin’s role in the drama is getting bigger. Also, she got a movie offer. 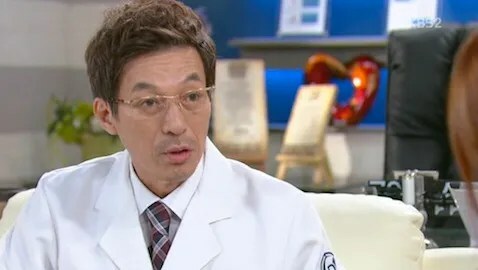 He advises that Joon-ho make his relationship with Yeon-ah clear: there is no relationship; then make his relationship with Soon-shin clear or else it will be bad for her. Hoity toity actress points out that Soon-shin’s getting more lines and pities Yeon-ah. She points out that Yeon-ah isn’t as close to Mi-ryeong anymore. Nice, lady. That’s nice. I don’t like Yeon-ah, and I thought that was mean. Then she brings up Joon-ho dating Soon-shin and Yeon-ah goes out to avoid it. She runs into the annoying Reporter Park and they go for a chat. He asks her about being Mi-ryeong’s daughter and not being as close as before. He wants to know everything about Mi-ryeong, especially about an accident. Next thing we know, Mi-ryeong sees Yeon-ah walking out with the reporter and they go for a chat. Why must everyone always relocate to the most random places for a chat? They seem to be in a restaurant, but isn’t Yeon-ah…filming? Anywho, Mi-ryeong asks Yeon-ah why she’s threatening her. Yeon-ah denies it and says she should understand her if she ever thought of her as a daughter. Guh. Mi-ryeong wonders if Joon-ho would return to Yeon-ah who is in complete denial. Mi-ryeong wonders when she became so spiteful and Yeon-ah says that she’s always been that way, just like Mi-ryeong. I see gears turning in the older woman’s head. Does she finally get how horribly she acts? She tells Yeon-ah to do what she wants because she won’t be afraid. She regrets not noticing how horrible Yeon-ah is. YES! That’s the best thing she’s done thus far! Now she needs to take care of it before Yeon-ah does, but that was the best thing she’s done thus far. YAY! As the cast and crew leave the restaurant, Young-hoon overhears the two gossipers talking about Soon-shin stealing Joon-ho from Yeon-ah. Young-hoon stops the gossiping and kicks them out. D’aw. You rock. Soon-shin tells him he didn’t have to do that and that she’ll take it as a penalty for her popularity. Then he mentions that he heard about her relationship with Joon-ho and promises to be there for her if Joon-ho is mean. Aw. Boyfriendless Chan-mi teases her for smiling too much around a single person and In-sung steps in to say there are plenty of men available. He might be near her. Then he takes her face in his hands to make her look at him. Hehe. They are cute. They all go for beer at the chicken place and Bok-man fusses over Soon-shin (while B2st’s “Shadow” plays in the background!!!! Because I’m shadow! Shadow! Shadow! We’ll miss you on Inkigayo IU! Sorry, didn’t mean to mention SBS during a KBS2 recap!) So In-sung tries to score points with Chan-mi’s dad by having him sit and calling him “abeonim” much to Chan-mi’s chagrin. He also sits Jung-ae down who asks about filming. Before they can talk long, Joon-ho calls and she goes outside to answer it. Chan-mi mutters something about her dating but stops herself, leaving Jung-ae curious. Soon-shin teases Joon-ho and tells him he can’t join her today. Then his voice gets louder and he appears in front of her…SINGING! It’s like a musical! He sings his replies to her making her smile at his adorkableness. They beam at each other and I rewind because it’s too damn cute. He says he just popped by to see her and asks her what she ate to be so pretty. She tries to send him off and he leans in for a kiss, but he doesn’t get one. Jung-ae comes outside and catches them. Soon-shin looks ready to pee her pants from nervousness. And then he thanks Jung-ae with a deep bow for ‘everything’, letting her work with him. Soon-shin shoves him away, mortified. Her mom totally gets it and asks if they’re dating. She seems pleased by the relationship though. At 3am, Yoo-shin takes a taxi home…and by home, I mean her old home. She crawls into her old bed and only stirs when Chan-woo calls. He realizes her drunken mistake and heads over to get her. Gil-ja is waiting up for them as the obsessed mother she is and gasps to see Yoo-shin passed out. She wakes up at Gil-ja’s screech and even smooches Gil-ja’s cheeks, declaring that she’s sorry and she loves her. Gil-ja would rather she go live with her family. HA! Mi-ryeong drinks and when Hwang finds her she admits Yeon-ah threatened her. She is feeling betrayed, but also understands Yeon-ah who is so like her. Hwang worries how to tell Soon-shin. They won’t tell her, she says and doesn’t know what to do. Mi-ryeong visits Dong-hyuk and asks if he knows about Joon-ho and Soon-shin. She says that they can’t date and wants him to do something about it. She also wants him to promise not to say anything about Chang-hoon’s accident. He realizes something is wrong and when he asks, she starts wallowing in her misery and crying. He asks her why the kids would have to break up, but she decides to leave it at that and makes a quick exit. Only…she runs into crankypants Soo-young who assumes the worse. She thinks Mi-ryeong is shameless enough to meet him in public. I honestly don’t think Mi-ryeong likes Dong-hyuk like he likes her. I think she just enjoys him company. However, with Soo-jung’s suspicious, I would just stop meeting him. It’s better that way. In any case, Mi-ryeong is baffled by Soo-jung’s question and for once, she really has no idea what’s going on. She says not every relationship is “like that/romantic.” he asks Soo-jung to be more thoughtful of others. She admits not being able to be close to Soo-jung because she never felt comfortable enough to tell her how she really felt about something. She pretends to care, but only cares about herself. They accuse each other some more and Soo-jung brings up Soon-shin, which infuriates Mi-ryeong. She orders her to stop and leaves for real this time. Dong-hyuk has witnessed the whole thing and brings his wife into his office. She throws down divorce papers after seeing the ad with Mi-ryeong spread on the table. He asks if they really have to divorce and when she doesn’t answer, he agrees to sign them. When she asks for an apology, he reminds her that she slapped him. May I remind you both that neither of you are guilt-free in this? Soo-jung tells Yi-jung about everything she THINKS is going on with the men in the family and their women. 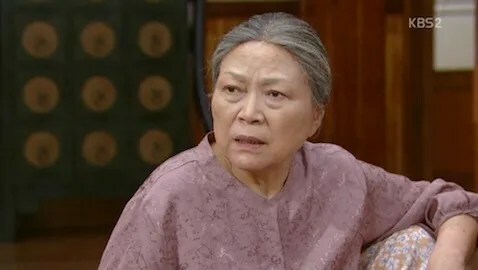 Yi-jung freaks out and sympathizes with her mother. When Joon-ho comes home, Yi-jung yells at him and Soo-jung leaves the room. 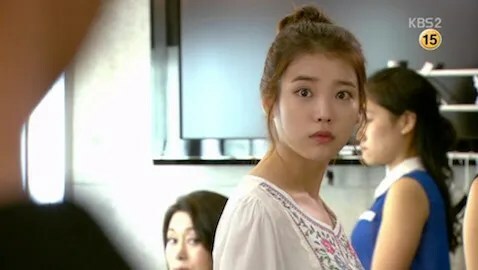 She accuses her brother of dating Soon-shin while their father ran off because of Mi-ryeong. Joon-ho just seems weary; that is, until she tells him about the divorce. Yi-jung wonders how the men could betray them like this. We get more annoying when the Ex decides to play superior at Jin-wook’s shop. Jin-wook steals himself and goes to serve the douche. He tries to avoid a fight, but the Ex jumps in and asks about his relationship with Hye-shin. Jin-wook evades the question and the Ex orders him to move out. He screams that Jin-wook has a violent record and wonders if Granny knows about it. Mr. Assistant listens with barely contained fury as Jin-wook politely tries to tell the Ex that none of it is his business. And just after I type that, the Ex mentions his daughter and it makes me sick. He uses her like a pawn. Just then Woo-joo comes in and stops the argument. Jin-wook reigns in his temper and goes to fetch their order. We find out that the Ex asked Woo-joo to meet her at the bakery specifically (douche). He immediately asks where her mom is. Wow, making your daughter play second lead. Woo-joo looks heartbroken and lies that she told her mother where she was. The Ex pretends that their food is no good (it’s fine and Woo-joo says that it’s fine) and makes Jin-wook make new ones. Just before he can go make new ones, Hye-shin marches in and glares at the Ex. I have a feeling that Jin-wook called her to let her know where Woo-joo was. The Ex pouts that Woo-joo won’t go to hagwon today, but to an amusement park with him. This time, Woo-joo has the sense to just go with her mother. The Ex chases after them and the Assistant stops him to make him pay so the Ex THROWS the money at him. The Assistant tells Jin-wook to leave the house or something bad will happen. I kinda agree. Poor guy. He notices the Ex left his phone and goes to return it. Hye-shin has just rejected the Ex’s advances and so the Ex immediately decides to vent his frustration on Jin-wook by grabbing his collar. Jin-wook asks him to let go and they get caught by Jung-ae. The Ex immediately plays it off and walks Jung-ae home. This is not good. He’s going to tell the family, isn’t he? He begs Granny and Jung-ae for help with Hye-shin. Jung-ae gets fed up with him and calls him a coward. She calls him out on his cheating ways. He ignored them when he was cheating and now wants them back when his girlfriend dumped him. He didn’t even go to Chang-hoon’s funeral. Doesn’t the Ex feel ashamed? No, he just likes to make excuses. Even Granny turns away from him. Jung-ae tells him to go back to Hong Kong. Then he does it. He says Hye-shin is in danger. He says Jin-wook is seducing Hye-shin and that he’s a dangerous ex-con. The Ex says he’s worried about Hye-shin because she’s blinded by him. Now, the criminal history should come as a shock, but these women should know how devious the Ex is. I hope they figure it out fast. An exhausted looking Yi-jung confronts Soon-shin at the station. Although Soon-shin tries to avoid it, Yi-jung won’t be stopped. She orders her to break up with Joon-ho in front of everyone in the room and won’t stop. Mi-ryeong is the cause of her parents divorce, she cries, shocking Soon-shin. How could she be so shameless? Soon-shin has no idea what Yi-jung is talking about, but Yi-jung doesn’t believe her. She promises to make Soon-shin’s life hell if she doesn’t break up with Joon-ho. Wow, really? This is so annoying. I hate everyone scapegoating Soon-shin. Soon-shin confronts Mi-ryeong about her relationship with Dong-hyuk. Mi-ryeong says there is nothing for her to feel guilty about. At least that’s true. Then Mi-ryeong asks if she has to date Joon-ho because a scandal could make her lose everything. She warns Soon-shin that Soo-jung hates her right now. Finally, Mi-ryeong’s advice feels heartfelt. She is truly worried for Soon-shin. Still, I think Joon-ho has the most power to stop this with a press conference or something. When Joon-ho comes home, Yi-jung angrily confronts him and tells him she met Soon-shin and gave her a warning. Yi-jung feels it’s her job to clean up the mess and prevent the divorce…but it’s not. On set, Joon-ho comes to talk to Soon-shin. Joon-ho apologizes for what his sister did. But Soon-shin is more concerned with the fact that he didn’t tell her about their parents. He tries to tell her that it’s nothing and that he’ll take care of it. He should tell her about it if they’re dating. That’s what couples do. They rely on each other. Yeon-ah gets distracted by watching them talk and gets scolded by the director. I wonder if Soon-shin will pull a Park Shi-hoo and be a second-lead usurper! Joon-ho has some man time with Young-hoon who basically wants to warn Joon-ho to be careful about the rumor between him and Soon-shin. He threatens to hurt Joon-ho if he hurts Soon-shin. He should’ve taken care of this sooner. Yeah, he should’ve. Then Young-hoon warns Joon-ho about the crazy, i.e. Yeon-ah. She’s devastated from losing him, Mi-ryeong and now her status since Soon-shin is the most popular in the drama. Young-hoon blames Joon-ho for part of Yeon-ah’s crazy, which…I don’t’ get. But Joon-ho meets Crazy and asks what to do so she’ll leave Soon-shin alone. He begs her to leave Soon-shin alone. Yeon-ah only cares about whether or not he’s worried about her. She has lost everything and she could ruin Soon-shin with one word. She asks him if he knows how Soon-shin’s father died. Cut to Reporter Park dragging Soon-shin off for an interview. He starts with pleasantries then eases into the topic of her father and how happy he’d be if he was alive. Park has a few questions for her about her father. I’m tired of everything but the romance in this drama. Joon-ho keeps secrets from Soon-shin. I don’t like that. But he’s so cute with her. I actually pitied Yi-jung because she looked so distraught over her parents. I hope Hye-shin and Jin-wook get together soon. I…want to see Soon-shin step up and fight for herself instead of letting things happen. sh should’ve asked Joon-ho to make some kind of public statement on them dating. That’s his job. He should’ve thought of it first. Thank you, Rainie. I’m glad that i found another one who agrees that Junho failed to protect his present love by being so lenient with his ex-lover who didn’t have any conscience & lost her pride in the process of her battle. Hi Raine, Okay I’m a little behind you people, but here goes. I think Young Hoon was practically saying the same thing twice to Joon-ho. He should’ve stopped Yeonn-ah way back when by just saying, leave me alone I’m not interested, retracted your statement or I will, then you will be embarressed. That’s what he meant by her crazy is partly his fault, he allows her to continue to manipulate him and the people around him. She keeps doing it because it’s working to some extent. The way this plot is going it looks like he cares more about Yeon-ah’s reputation and feelings than Soon shin’s, and she’s not even his client. Besides that, I could see the mother and daughters next moves a mile away, why couldn’t he? And maybe some how warn them off and tell Soon shin to be ready. Also like you said he should tell her everything that is going on because it all affects her life and her career. It just feels like now they are going to make our OST, take the misunderstandings from no communication, or outright lies, highway that leads right to that murky, downer of a swamp that’s so hard to get through. If I have to FF through Joon-ho and Soon shin, there’s nothing much left. Thanks Raine for your hard work getting through this, your a real Kdrama hero. I’m so glad you go and watch other things, you need a break and a shot of Soju, Gun bae !. Oh yea I am usually a lurker, but I had to give you some support. Hwaiting!!!!!!!! Thank you! I agree. He should’ve done something a long time ago. I think the character, had he not been controlled by the writers, would’ve told a LONG time ago. But the writers had this plan for getting the show to 50 episodes. The character development suffers from that. Look at Smile, you and Ojjakyo brothers and even Family’s Honor. They are GRASPING for straws by the end. Joon-ho was proactive before so it’s strange that he is not now.